Quintuple–that’s five! I’m sure you know that and I’m not trying to insult your intelligence, but I myself am still a bit shocked that five types of chocolate can fit into a single brownie. Somehow, in one little square, there is room for cocoa powder and unsweetened, bittersweet, milk and white chocolates. Talk about a fudgy brownie…I think this one may actually be fudge! If that white chocolate glaze looks I laid it on a little thick, well umm, that’s because I did. I thought the original amount seemed a little thin so I added a bit more white chocolate and a bit more cream, and suddenly I had a thick slick of icing! These brownies are so dangerously good, that I’d feel guilty (in many ways) keeping them to myself. Jenny from All Things Edible has a beautiful new home, and I’m going to bring them to her housewarming party! This was Brown Eyed Baker Michelle’s TWD pick shortly before I joined the group, about a year ago. For the recipe, look in Baking: From My Home to Yours by Dorie Greenspan (she also has it here on NPR’s website) or read Michelle’s post. Those look delicious. Especially that top layer of white chocolate. 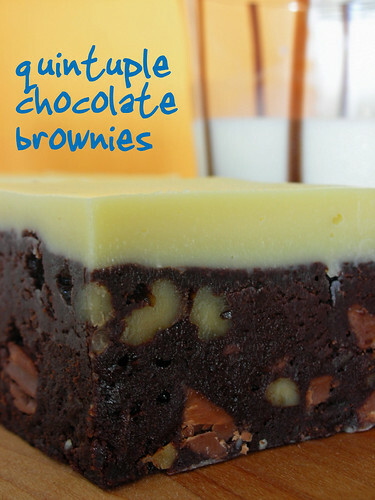 I went back and make these too and actually have made them several times 🙂 I agree with you- these are absolutely fabulous brownies! Your white chocolate layer looks just perfect! I loved this brownie too! that was a good idea to double the glaze, cause when i made it I thought the glaze seemed a bit mean! Wow. Your brownies look perfect. Thanks for the delicious reminder. I gained 5 pounds just reading the recipe. Definitely will try these. These are one of my favorite TWD recipes so far! That white chocolate icing is perfect! These look so good! 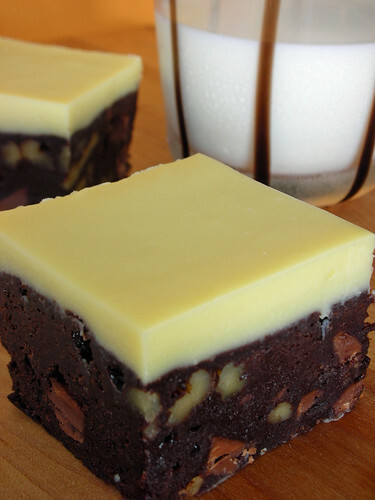 Nothing better than a chewy, nutty brownie..
OMG Drooling….these are a chocoholics dream!!! those look so intense! in a really, really good way. like, the only thing i would eat if a) i was stuck on a desert island and i had an endless supply of one food or b) calories didn’t exist. Lovely brownies! Came by looking for the tuiles though! Holy macaroni…these are deliciously wicked! OMGosh! Those brownies are fabulous! They do look like fudge! And if I remember correctly, they were over the top decadent and sinfully rich too! Gorgeous photos as always! I just gained 5 pounds from reading this post – but I don’t care. I have GOT to have those brownies! They look incredible! These look delightfully mouthwaterinly fudgy! I’m currently on a little sugar fast (I’ve just been eating way too much), but I would love to break my fast with one of these! This is dangerous and I will have to hide them when I make them.5 kinds of chocolate, phew!!!! these surely look decadent! I must say that there s never enough chocolate in chocolate desserts but maybe in this one it does 🙂 so good! They look incredible! I guess the irony of beautifully presented food is that it’s made to be destroyed. oH MY GOD…This looks awesome!! I will make this for sure!! Hi there! I just stumbled upon your blog, and what a post to start with! That brownie looks amazing. How did you cut it so smoothly? Thanks to your photos, I’m on my way into the other room to put a post-it on this page right now! I made these as a rewind a few months ago. It’s a fabulous recipe! Great job. Yummy! These are one of the recipes I still need to make. Yours look delicious. Oh my those look decadent! Soooo good. Thanks for bringing them! Heaven on a plate. I want one!!! Wow. I haven’t made these yet, but I really should. Especially after seeing yours – yum! Those give new meaning to the word decadent! Wow! These look amazing, they’re near the top of my “to-try” list from this book. You are eerily psychic! I was just thinking about making these next week, since I missed them during the first go-round. You have convinced me to do it–yours look amazing! Ah ya caught me gawking….just had to come by for a look, …. again. Those are so impressive!! !